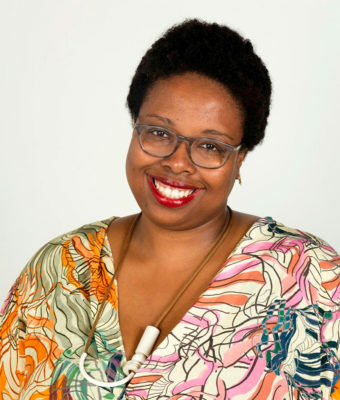 Portland State University’s School of Art + Design, in partnership with the University of Oregon’s College of Design, The Ford Family Foundation and Portland Art Museum, is pleased to present Jamillah James for the spring 2019 chapter of the Curator and Critic Tours and Lectures program, Connective Conversations | Inside Oregon Art. Jamillah James is Curator at the Institute of Contemporary Art, Los Angeles (ICA LA). With Margot Norton, she is curating the 2021 edition of the New Museum Triennial. Prior to joining ICA LA in 2016, James was Assistant Curator at the Hammer Museum, Los Angeles, working in collaboration with the nonprofit Art + Practice. She has held curatorial positions at the Studio Museum in Harlem, New York; the Queens Museum, Flushing, New York; and independently organized many exhibitions, performances, screenings, and public programs at alternative and artist-run spaces throughout the US and Canada since 2004. Launched in 2010, the Connective Conversations | Curator and Critic Tour is a key element of The Ford Family Foundation’s Visual Arts Program, which honors interest in the visual arts by the late Mrs. Hallie Ford, a co-founder of The Foundation. The initiative was founded as a collaboration with The Ford Family Foundation and the University of Oregon School of Art and Design. The Tour brings professional curators and critics from outside of the Northwest to conduct one-on-one studio visits with established Oregon artists, deliver lectures, and join in community conversations. Principle goals are to enhance the quality of artistic endeavors throughout the state by visual artists and visual arts institutions, and to improve Oregon’s visual arts ecology by making strategic investments in Oregon visual arts institutions. In 2015 and 2016, the program partnership expanded to include Reed College-Douglas F. Cooley Memorial Art Gallery, Oregon College of Art and Craft. Pacific Northwest College of Art and Portland State University College of the Arts joined the partnership in 2017-18. The Ford Family Foundation’s Visual Arts program honors the interests in the visual arts by Mrs. Hallie Ford, a co-founder of The Foundation. The principal goals are to help enhance the quality of artistic endeavor and body of work by Oregon’s most promising visual artists and to improve Oregon’s visual arts ecology by making strategic investments in Oregon visual arts institutions.